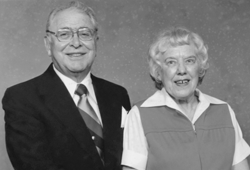 Forrest and Helen Pancoast Hoot established an endowed scholarship many years ago. They enjoyed the opportunity of seeing students receive scholarships from this generous gift during their lives. It was always their dream to add to that total when they were certain their assets would be sufficient to see them through their golden years. When Forrest passed away, a couple of years after his beloved Helen, $25,000 was added to their scholarship from their estate.